Wisdom evoking nostalgia ..eh ? The pic spoke a thousand words…. …and the words described a million pics….. Profound. As usual. Childhood memories are most precious one’s. I think I am never gonna grow up. And that sand castle in the picture reminds me of my numerous attempts to build a proper castle by my own and I always failed. But even today, I still try to build a sand castle whenever I am in the beaches. And I get to relive a bit of my childhood with my daughter 😀 Beautiful one. We never outgrow our childhood and revert to it in our old age. There’s a small section of life, when we act matured and behave as adults. But, when we grow old, we compare the books and decide ki bachpan me hi zyada khush the! Then we discard the veneer of maturity and begin our second childhood in old age. The same tantrums and free laughter. Very beautiful haiku and as all haiku go, exquisite and deep. Freud believed the character-structure of a person is formed during childhood. According to psychoanalysis, childhood memories are responsible for adult’s behavior. Thanks, Arpita…glad to see you after a long time… 🙂 How are you doing? Absolutely Mani it’s all begins there. Nahi re, I had lot of bad experiences in childhood. I don’t think I am a nice human being as well re. Here we show only our better side, right? Can’t compare to them by any chance. Well, they don’t blog or do better things in life because of their monstrous soul. So true! 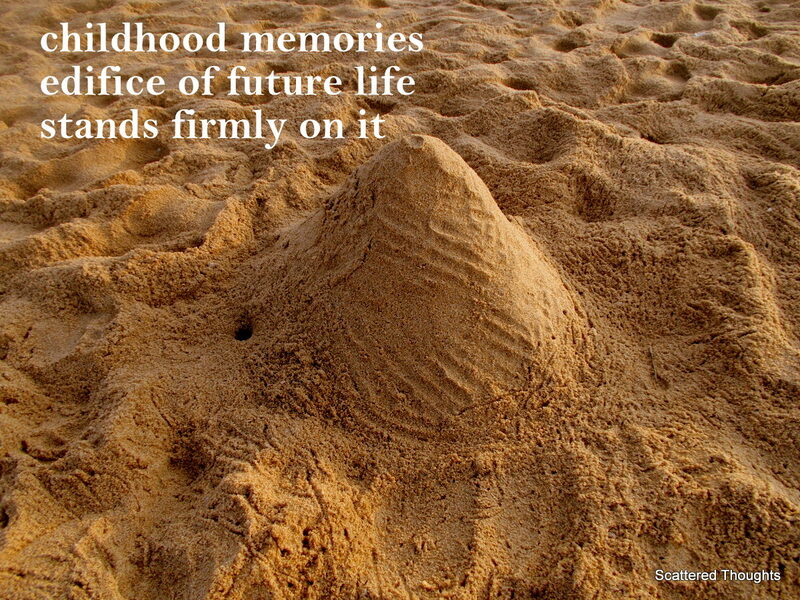 Good childhood memories are a source of comfort.